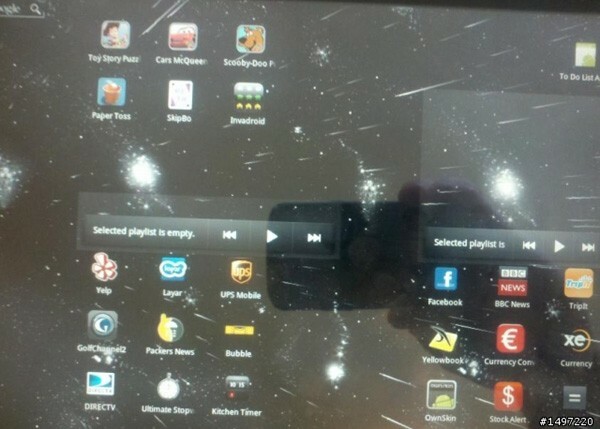 You are looking at a homescreen picture for the Motorola Everest (allegedly), which is the 10″ tablet expected to be headed to Verizon as the “DROID” tablet some time in early 2011. The pic popped up on Mobile01 with a handful of specs from a user claiming to have fondled the device for over an hour. So what does this beauty have packed into it? An NVIDIA Tegra 2 processor, 2MP front camera, 5MP back camera, gyroscope, 32GB built-in storage plus an SD card slot. The Moto Tablet will also launch as an LTE device, which we’ve heard in the past. Check out these high-res Motorola Everest pictures from earlier in the week to see what the device actually looks like. Pretty, right?